Set in a beautiful location overlooking the sea, our 25m pool hosts a variety of swimming activities. Click Timetable for full brochure. A responsible adult (16+) may bring 2 children under the age of 8 but only 1 of those children can be under 5 years. The adult must be in the water with the children at all times. Floats at lifeguard's discretion. For safety reasons we cannot allow masks, snorkels, fins or wet suits during fun sessions. We welcome swimmers with disabilities and every effort has been made to make the Lido as accessible as possible. These is a hearing loop at reception, toilet with grab rails and steps available for entry into the pool. 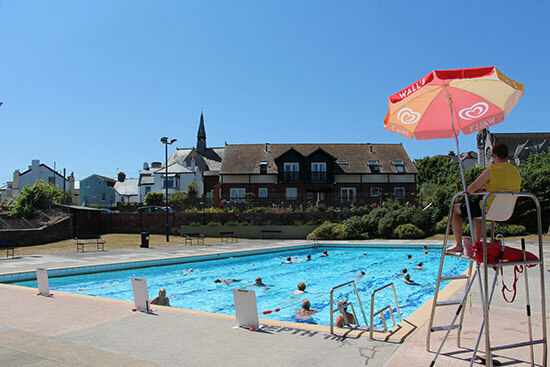 However, we regret that the lido is not suitable for some wheelchair users as we have no pool hoist. What a beautiful night for a swim! I swam my mile and then decided to stay on for an hour long conditioning class! I met some lovely lane mates and really enjoyed the company despite being totally and utterly exhausted! Off for a well deserved plate of fish and chips as the sun goes down. ​The best place in Teignmouth. A real asset to the town. We spent so much time at the Lido in the summer, we cannot wait for more hot weather to spend time with our family and friends. ​Thank you Teignbridge Leisure for making the Lido another success this year (2017) we cannot wait for 2018.